Robed in white he pervades the world, shining like moonlight, four-armed lord, unto his smiling face we pray for removing all obstacles. Now there has been a long-standing controversy as to who the Devata of this verse is. Some people think it's addressed to Ganesha, since it mentions removing obstacles. Others think it's addressed to Vishnu, because it has the word vishnum in it, it's associated with the Vishnu Sahasranamam, and they argue that Vishnu is more than capable of removing any obstacle. And still others think it refers to Vishnu's general Vishvaksena, since he is worshipped by Sri Vaishnavas to remove obstacles and the Shuklambharadharam verse is often juxtaposed with the "Yasya dvirada" verse explicitly invoking Vishvaksena. But my question is not about the controversy itself, but about the scriptural basis for this verse. The Vishnu Sahasranamam was most famously told by Bhishma to Yudhisthira in the Anushasana Parva of the Mahabharata, but the Anushasana Parva doesn't mention the verse at all. 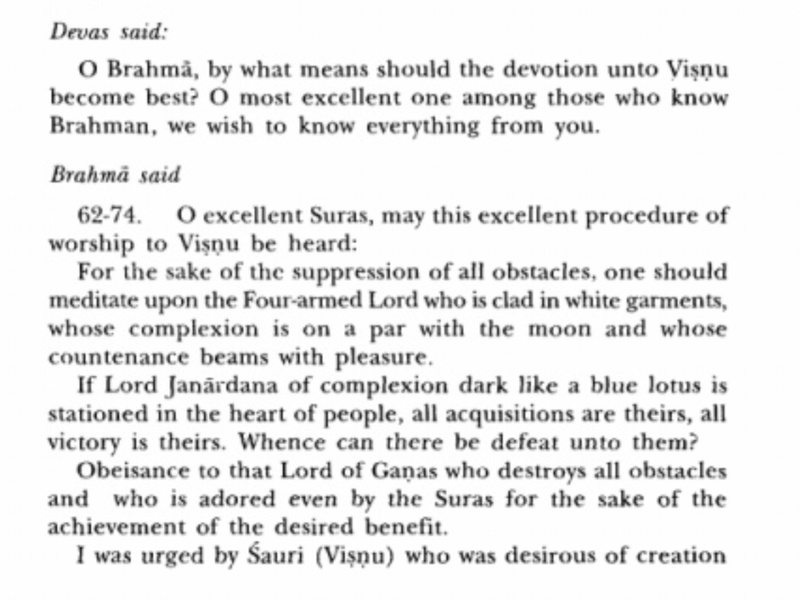 The only place I know of in Hindu scripture is in this excerpt from the Avantya Khanda of Skanda Purana, where Brahma gives the Shuklambharadham verse, but does not say anything about its Devata. So my question is, what scriptures other than the Skanda Purana contain the Shuklambharadharam verse? Is it mentioned in any Pancharatra Agamas? I assume that is where the traditional procedure for chanting the Sahasranamam comes from. And do any scriptures which mention it explicitly mention the Devata? Browse other questions tagged vishnu puranas sri-vaishnava skanda-purana vishnu-sahasranama . Which chapter of Skanda Purana contains Guru Gita? Where is Subrahmanya Sahasranamam mentioned in the Skanda Purana? What is the location of this verse from Skanda Purana? What is the structure of Skanda Purana?